In February, 2015, US Sailing and AmericaOne announced a very exciting initiative, called Project Pipeline. I want to give you a little personal perspective on the initiative and pass along the link to the press release. 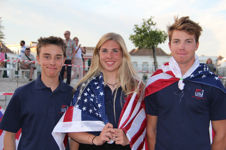 Targeting the best American youth talent, Project Pipeline is the strategy behind a new-look Olympic Development Program, which aims to better serve young sailors, lead them into high-performance boats earlier in their development, and build well-rounded sailors with complete skill sets. Providing training/racing opportunities with world-class coaching and the highest level of technical standards are the core principles of the initiative. Mike Dwight May 10, 2015 Category: Uncategorized.